Oxfordshire County Council reports show that traffic will more than double on West End, Hailey Road and Farmers Close, and potentially lead to significant air quality issues on West End. The building of the West End Link Road is supposed to alleviate traffic problems and associated pollution on Bridge Street, but traffic will only fall by 10%, and therefore isn't a solution to the problem. For flow data go to appendices on pages 43 & 44, 56 & 57, 66 & 67. This data indicates traffic flows moving in each direction along routes through Witney. ‘Base’ data shows current (2013) flows (pages 43 & 44). Flows after building of North Witney SDA and the West End Link Road (WEL2) with ‘standard junctions’ are on pages 56 & 57, and with ‘high capacity’ junctions (three lanes of traffic entering at Cannon Pool roundabout) on the West End Link Road on pages 66 & 67. Traffic volumes at peak times (am & pm) will increase (over the 2013 ‘base’ flows) by two-and-a-half fold on the twisty and narrow Farmers Close between New Yatt Rd and Hailey Rd, making it a dangerous rat-run. Hailey Rd will also see a two-and-a-half fold increase in traffic volumes over current levels at peak times. Paragraph d) the provision of other supporting transport infrastructure, including mitigating the impact of traffic associated with the development, has yet to be shown to be achievable. Bridge St sees a traffic volume reduction of just 10% - hardly an endorsement of the £23m West End Link Rd, which is supposed to be the solution to Bridge Street’s traffic and air quality problems. Although West End (B4022) will experience reduced levels of traffic after the building of the West End Link Road (& Shores Green junction upgrade), Oxfordshire County Council have had to issue another report (2017 Witney Transport Strategy – link below), which attempts to resolve these inadequacies of WEL2, and justify the whole scheme. This data, obtained through a Freedom of Information request, shows the am & pm traffic flows for various key roads in North Witney (highlighted). It compares the baseline (2013) with Option One (partial clockwise gyratory around Bridge St/Mill St/ WEL2/West End Rd) and Option Two (closure of Bridge St to private traffic, two-way flow on and Mill St/WEL2/West End Rd. 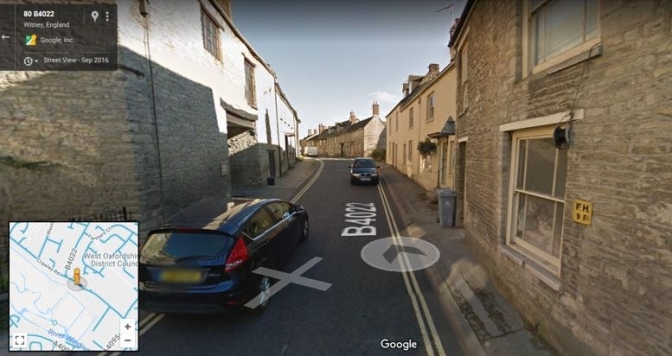 Whilst this gives major relief to Bridge St, West End (B4022) becomes part of the main Witney river crossing route and consequently traffic volumes increase dramatically, raising the probability of this very narrow old road becoming an Air Quality Management Area. It is also our opinion that, Local Plan POLICY WIT2 (North Witney Strategic Development Area), Paragraph d) the provision of other supporting transport infrastructure, including mitigating the impact of traffic associated with the development, has yet to be shown to be achievable. West End would see a more than doubling of traffic and face air quality issues.